Next knitting project is for a friend who also loves How I Met Your Mother, and will totally appreciate the Ted packing his overnight bag, not with slippers but British Morning Socks. But said friend is also going to England soon to visit family so it’s a pretty good double play on words. So I was looking through my basic knitting patterns (free download from knitting daily) and thought that the Mocassins looked easy enough. I used Patons Inca in red and black. And followed the pattern to the letter. 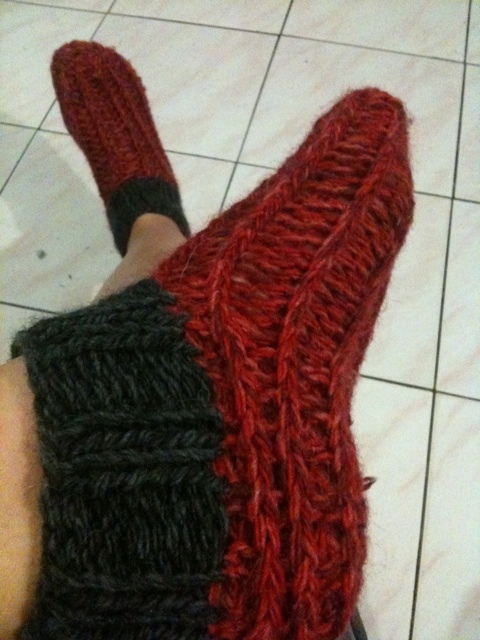 It uses size 8 double pointed needles, so it looks like a sock pretty quickly. And then it switches to size 5 double pointed for that extra bit of detail. I can’t reproduce the pattern here, but it should be easy enough to find on the Knitting Daily site. I’m currently doing up a pair for myself in the Moda Cardellino yarn, but you can’t really see the ribbing detail as much with the multi-coloured yarn. I think i’ll have to buy some more Patons Inca, it really is the better yarn for it. I can see these becoming a standby birthday/christmas present. I’m giving them to my friend tonight. Hopefully she’ll like them (and get the joke). Too cute! Do you worry about slipping on wood floors? 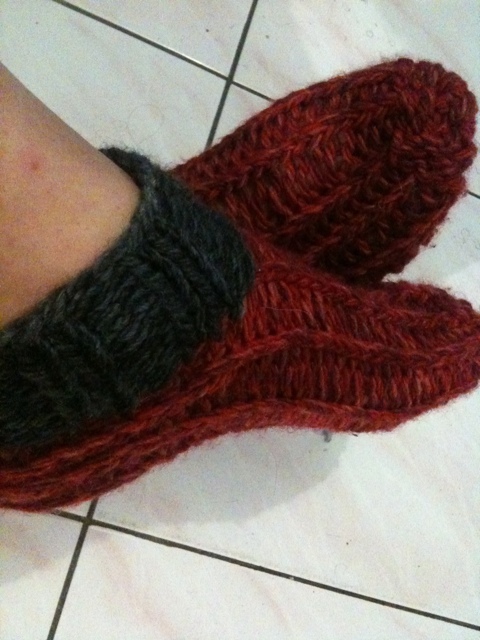 I had that problem until I sewed a leather sole onto my knit slippers. I have tiles, but its still an issue. The leather is a good idea. I’ve heard a spray adhesive works too. Just to make them a bit more grippy. Ah, had not heard of spray adhesive … Thanks for the tip!! I wonder what hairspray would do. Being a Brit should I have heard of these I wonder? 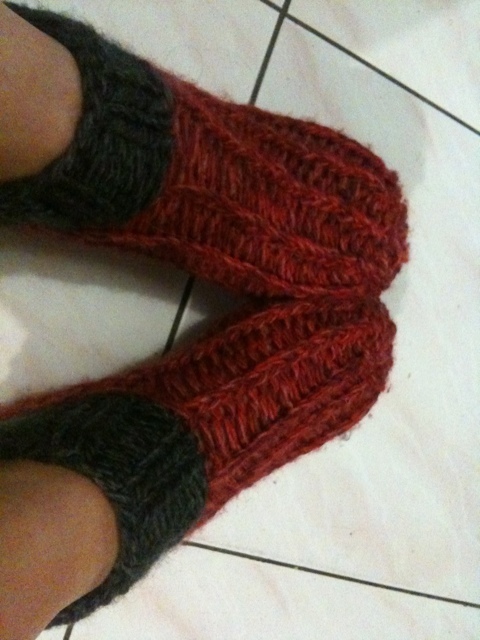 I like them a lot – a bit like shoes with socks already attached. you can get stuff to put on the bottom that is non slip made especially. that I actually enjoyed the standard info a person provide on your visitors?